View basket “Nutmix Wafters with Booster Liquid” has been added to your basket. The nutmix is an amazing blend of naturally derived nut ingredients including tiger, peanut and hazelnut meals along with whey proteins, calcium caseianate and vegetable proteins to give this bait a unique texture and smell. 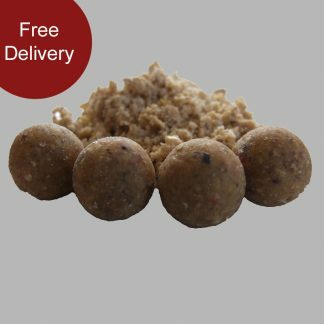 Also included into this bait is a dedicated feed stimulant that increases appertite as well as aiding digestion along with a blend of real nut oils and a totally exclusive nutty flavour with a creamy back note. The Nutmix airball pop ups have been specifically tailored for today’s modern rigs ensuring an unpresidented level of consistant bouyancy and minimal water absorption giving the angler confidence to leave their hookbaits out for the duration of their stay if needed. These very special pop ups have been made with the optimum amount of floatant for most rigs whilst maintaining high levels of basemix to replicate the free offerings and the exact same set of attractors as is found within our bottom baits providing an excellent alternative hookbait option.